I am starting this thread since we don't have one already for the -6. I would really like to see what stage other builders are at. There are all of 3-4 active RV-6 builders using Kitlog, so not a lot of reference material. This thread may also act as a list of builders that can provide guidance to those coming after them. If you just completed a particular stage of the build, you are in a good position to provide advice to someone starting that stage. Hopefully one of the Mods will see fit to make this a sticky. 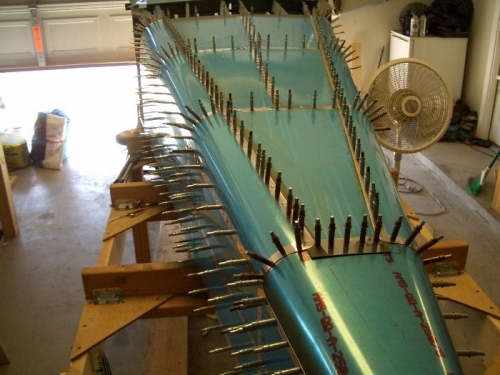 I am currently working on the fuselage kit. I recently finished (well, mostly finished) riveting the left tailcone skin on and just yesterday started on the right side. 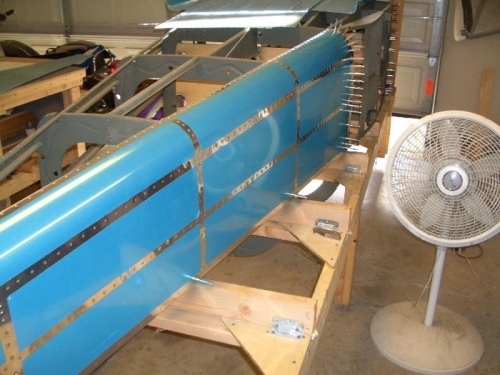 All the fuselage skins have been fitted and drilled and most of the countersinking / dimpling of the structure is complete. Once I get these tailcone skins riveted, I just need to fit / drill the rudder pedal assembly and then I can rivet the side skins. Right and bottom skins clecoed in place so I could mark the bottom skin for final triming of the aft edge. I had a slight misallignment of the skin (didn't have it strapped tight enough when drilled) causing a gap at the aft corner radius. I corrected the gap by straping and drilling out to #30. This worked just fine and still left me with ample egde distance. These are all dimpled for -4 rivets, not "oops" rivets. The project is looking great! I like the finish on the panel. Is that an overlay or real CF? I can hardly fathom a guess at the movie, it reminds me of Harts War or Air America. I was down in your neck of the woods this time last year (well, to the north at least). That is a beautiful country you have there. The panel was originally cut for steam gauges and the Vans map box. Being a cheapskate, I got a sheet of 0.025" carbon fibre from DragonPlate in the US to cover the panel instead of getting another panel. The CF can be moulded to simple curves with a heat gun if you are careful. It is held down with good quality contact adhesive. Thanks for the good rap on our country. I can't think of a nicer place to live myself (and only one hill to run into @ 7,310 odd feet!). Congratulations! Several free beers (not Fosters which tastes like Bud) will be available on the bar at the Royal Mail Hotel, Spencer Street, Melbourne for you to imbibe. Colin, I have one of the (if not THE) longest-running -6A project in the St. Louis area. Life does tend to get in the way. Anyhow, I'm pretty much done with the build. The RV is at my local airport sitting in our chapter hangar, waiting on the hot weather and some family issues to moderate. I'll be glad to help wherever I can. This thread is a great idea, Colin! I will post pictures of my progress as soon as I can figure out how. This is my first time trying to post pictures so I apologize up front if it's a disaster. My -6 wings and tail are both basically finished. I'm currently skinning the fuselage. Colin and I started our fuselages at about the same time and he's much further along than I am. I have a list of excuses that I won't share at this time. Go to www.photobucket.com, or any other host. Post the picture there from "My pictures", or wherever you have them. Click on the posted picture and you'll see 4 options. Click on "Direct link" and copy that. Then click on this page and click on the little yellow picture with the mountains and paste there, just be sure there is not two http:/on the left side of the little box. I usually have to delete the one that shows when you click on the yellow box.